The Occupational Safety & Health Administration (OSHA) has basic standard precautions that are meant to keep employees and consumers safe. These standard precautions are also referred to as universal precautions or bloodborne pathogen precautions. Dual bifocal safety glasses are needed by approximately 10 percent of the population. They provide a superior level of vision to users who need assistance reading print while engaging in activities where safety glasses are needed. All businesses should have an emergency response health and safety plan in place. While it may be unlikely that this kind of situation will occur, planning is key to taking appropriate action if it does happen. The answers given to employee safety survey questions can help to keep workers focused on this issue, as well as provide owners and managers with valuable feedback about issues in the workplace. Following ergonomic safety practices at work and at home greatly reduces your risk of suffering from the painful cumulative damage that stress and strain places on your body. A forklift safety cage is necessary to ensure that workers are able to perform their job at elevated levels in a safe manner. If you're interested in seeking employment in an industrial occupation, getting a forklift safety training certificate before you start applying for jobs can give you a competitive advantage in the job market. Free caution signs will keep your employees safe and informed without destroying the annual budget. Videos can be a great way to teach family members and coworkers about important safety concepts. Several sites offer free videos on a variety of topics, and one of them is sure to meet your needs. Staying safe is a little easier when there are reminders posted nearby. Use safety posters to serve as visual prompts that watching out for hazards can help keep everyone healthy and happy. Whether at home, at work, or on vacation, practicing safe behavior matters to everyone. One way to make safety a priority is to utilize humorous slogans that are easy to remember. Being a cashier is one of the most dangerous jobs as far as robberies are concerned, for this reason health and safety of cashiers at work should be of great concern to both employees and their employers. Construction sites can be a great place to work but the speed in which events happen mixed with the sum of possible safety hazards make heavy equipment construction safety a top priority. Individuals who work outside in the winter should wear high visibility winter safety gear. Sanitation workers, traffic officers and security guards are just a few of the outdoor occupations that depend upon high visibility clothing to save them from injury. All aspects of mechanical press safety must be strictly followed to prevent accidents and injuries in the workplace. In order to ensure you comply with all the OSHA regulations, it is best to get the right training. The types of safety training and certification requirements that apply to you depend on the type of work that you do. Many people choose to protect their skin with special clothing for a variety of reasons, and it is easy to shop for protective clothing online to meet any size, material and safety requirements. Depending on the type of business involved and the organization's needs, the role of safety professional in the workplace will vary. Utilizing marketing strategies to improve workplace safety is a concept that has been researched by scientists and employment agencies to determine how best to avoid injury on work sites. Ideally, the job of teaching workplace safety should start in schools and continue with job-specific education in the workplace. All employees should be familiar with their rights and responsibilities under current occupational heath and safety regulations. Titmus safety glasses are recognized as being quality products. They are delivered to consumers around the world who need prescription safety frames. Universal precautions for health and safety are measures that are designed to protect against the possible transmission of blood borne pathogens from patients to medical personnel, health care workers and medical and health support personnel. This university job safety analysis manual will help you learn how to conduct a great job safety analysis at your workplace. What Is the Purpose of OSHA? What is the purpose of OSHA? Whether you are an employee who has completed OSHA training or a business owner or manager responsible for enforcing and monitoring workplace safety regulations, you have probably asked yourself this questions many times. A work coverall with safety features can ensure your well-being no matter what the job. Workplace safety is important for a variety of reasons, including compliance with OSHA regulations, reducing the potential for painful and costly accidents, reducing worker's compensation claims and more. Every employee, manager and business owner needs to be knowledgeable about what it takes to keep their workplaces safe and have the ability to recognize, report and correct hazards. Increasing your knowledge of workplace safety can help protect you from injuries, as well as your co-workers, customers and others who visit your place of business. 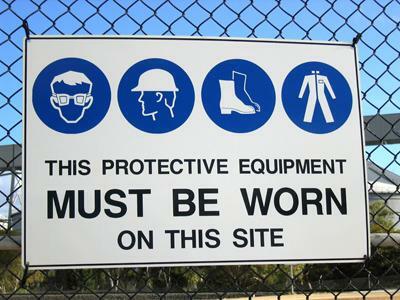 When it comes to taking steps to maintain a safe workplace, you can't be too careful. While making sure that there aren't trip and fall risks is one of the first concerns that typically comes to mind when people think about making sure their workplaces are safe, there are many other potential hazards in places of business. Safety concerns are just as important in offices and retail stores as they are in manufacturing plants and road work zones. Whatever workplace safety matters you need to learn about, you'll find what you need when you visit the Workplace Safety Ideas category on LoveToKnow Safety. The more you know about what's involved in staying safe in your place of business, the less likely it is that you'll have to deal with the trauma and stress of an injury that could have been prevented. Whether you are looking for information for yourself or if you are a safety professional responsible for maintaining a safe working environment for your company, it's a good idea to visit this site regularly to find out what new information has been added. When you're looking for reliable workplace safety facts and tips, let LoveToKnow be your trusted resource.